Maybe it's just me, or I cared even less, but Halloween seems more low-key this year. The only advantage I see is that my kids have been giving ME candy. I've been getting a slight time-out while the kids make haunted houses, spiders and masks. 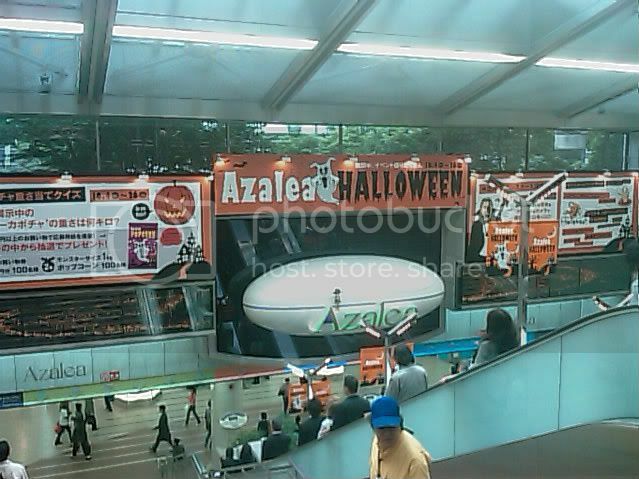 For some reason Kawasaki seems to be the epicentre of Halloween celebrations. They had a parade this year that I missed once more. Oh well. 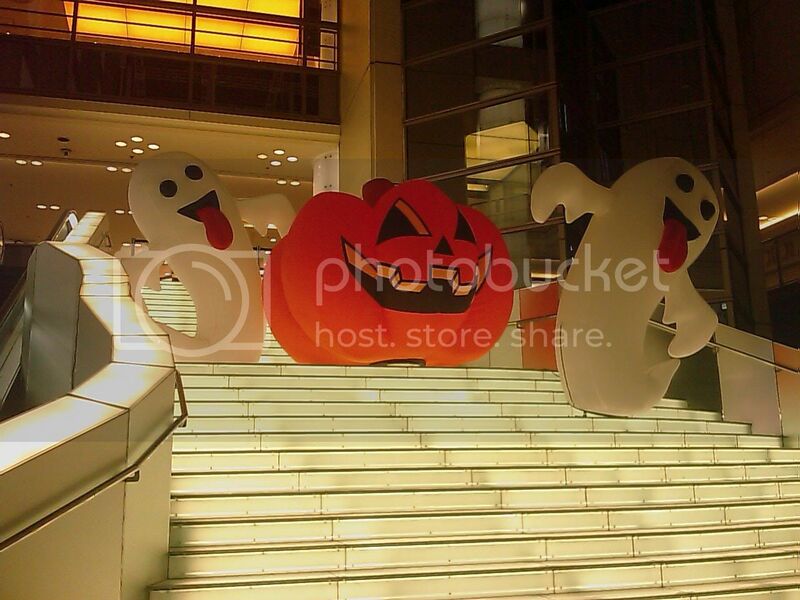 These were on the steps of a Kawasaki shopping mall. The Azalea shopping area is uncannily like Yokohama's Diamond one. I have a feeling the same town planner created both places. Come to think of it, he probably designed all of Tokyo. Thou shalt have Pachinko near every station! 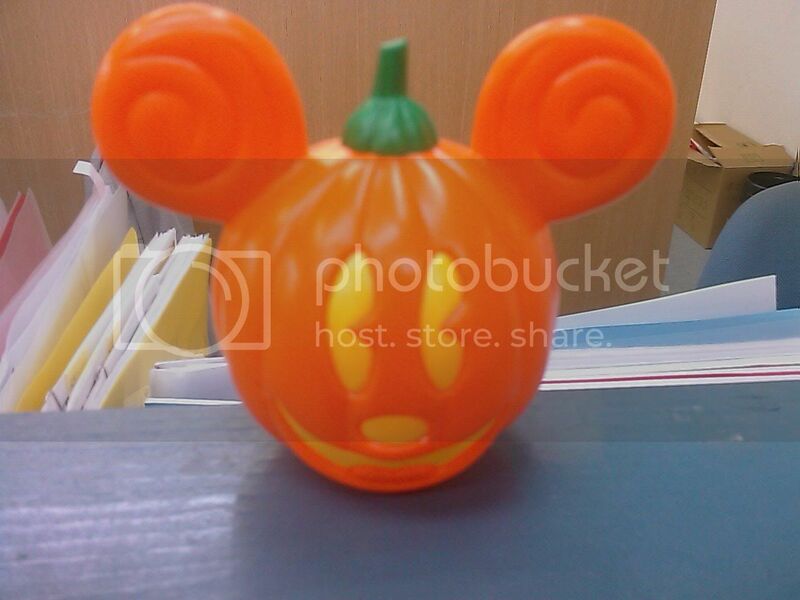 Of course, Halloween is not complete without the Mickey Jack-o-Lantern is it? Like every other sequel this one is yet again a let down. Can't wait till Halloween 2009. It's been a few days now and I'm really getting my head around my new iPhone. Trying it out at the shops, I wasn't as impressed as I am until now, when I've got the chance to really see what it can do. Coming from a Windows phone, the experience is just smoother and more polished. Yes, it does lack the much-requested, and often denied "cut and paste", and a video recorder, but I've found a way to get around things like that. Coming from the "user decides" upgradability of windows ROMs, the process isn't that difficult. What I'm looking for now, is a good case to protect this little bundle of goodness. 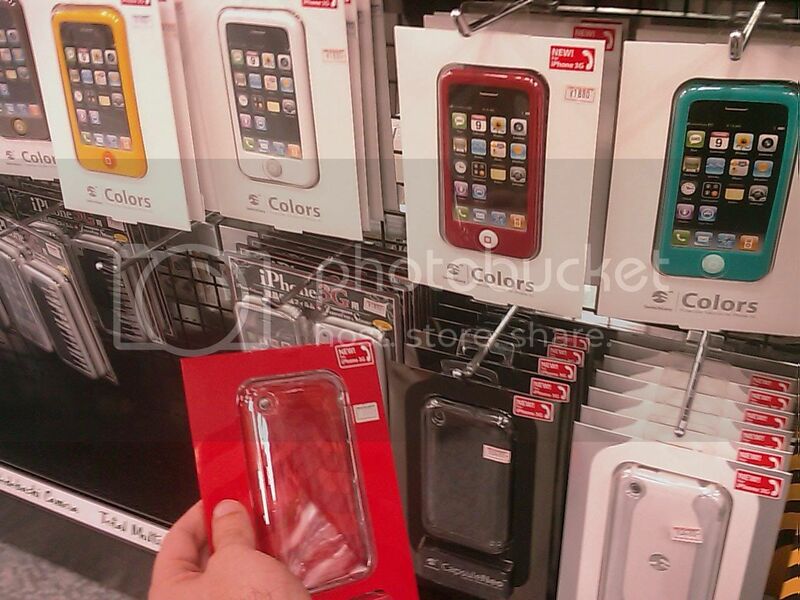 Most of the big stores only have a small selection of cases. Luckily today in Yokohama I found a great range at Yodobashi in Yokohama. The ones that have caught my eye, are from Switcheasy. They really stand out, and look pretty funky. So what were my other options instead of getting the iPhone? Well, if your heart's not set on (or brainwashed) to get an iPhone, the next best thing is the Emobile S21HT, otherwise known as the HTC Touch Diamond. On the eMobile plan they offer an unlimited internet plan that maxes out at 5,000 yen. What makes that deal particularly sweet is that you can tether, that is use the mobile as a modem to get internet to a PC, which is something Softbank don't allow without paying through the nose. What stopped me from that was the S21HT's fixed japanese menus and the slow, laggy interface. My TYTN II had better performance than this! The other alternative option was to get one of the new Dell mini 9's and an eMobile modem for anywhere internet on a similar plan to the mobile. The other plus is the Dell's apparent hackability to run Apple's OSX, Leopard. If only Apple would make their own netbook! I guess for now the iPhone is the next best thing. Internet in your pocket. I got the call today from Bic Camera to say they won't exchange my phone because the mark is too small. It seems pointless for them to even ask me to look it over if that's their attitude. Like I said previously, the mark is tiny. I can't even photograph it, because I don't have any macro function on any of my cameras. But it's still quite easy to spot with the naked eye. The point is, "customer service" is not just selling the product, it has to do with customer satisfaction, and after-sales service as well. Japanese are good at making the sale an experience, but if you come back with a problem, or not happy with it, "Too Bad". You just have to grin and bear it. I wonder if they even bothered to try to get me a replacement. I waited over an hour for them to call last night. If they were not going to do it, they could've saved me the wasted minutes of my life going back into Shinjuku to pick it up today. Having said all that, Softbank are giving 5000 yen credit to people who recommend others to their service, AND to the new subscriber. So, if you aren't too fussed about the (lack of) customer service in Japan, let me recommend you, and at least you and I can get something more out of this. Finally I went and did it. 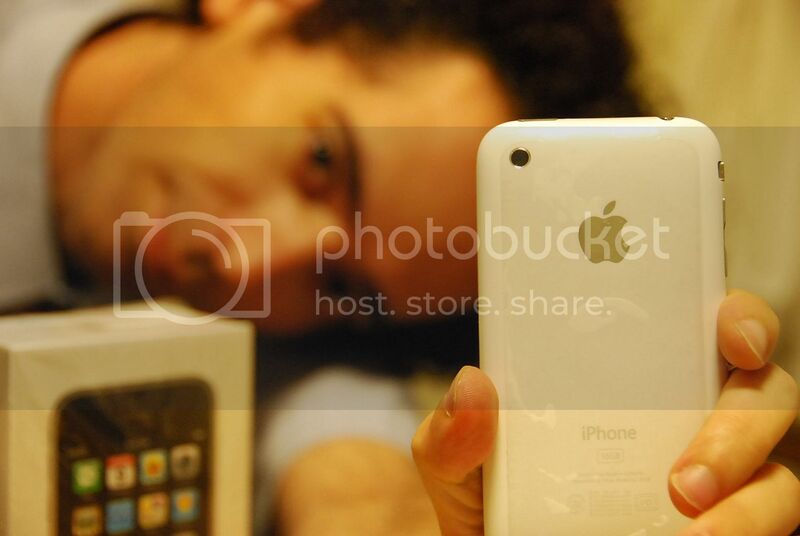 I've got an iPhone. Well actually I DON'T. Today I went into Shinjuku to Bic Camera to get that phone. I decided on a white one. It took ages to process the application and just before I was ready to walk out of the store, the clerk got me to look over the phone to make sure I was happy with it. Pretty quickly I saw a small dirt-sized spec on the white back that didn't come off. I know that I shouldn't be so precious with a white one, but before I walked out I wanted it to be flawless. Unfortunately it couldn't be resolved straight away so I come home empty-handed. I made a new contract even though I am with the same company. For new customer's contracts, the phone outright is 80,640 yen, but if you're an existing customer the same phone is 87,840 yen! Great customer service. Hmm. So why did I pay for it in full? Points! If you have a point card you can claim, usually a 10% of the purchase price towards something else. In this case it gives me 8000 yen to play with. Going to the phone company directly gives you zero, zilch. Besides this bonus, from the third month of the contract SB will discount 1920 yen every month, the same as if I payed it off per month. After 24, 27 months, the real price for the phone is 34,560 yen (with the 10% store credit this becomes 26,496 yen). So, it makes that big, scary upfront payment much more palatable now, right? The phone is locked to the evil phone company, even when the contract is completed. Hopefully in the near future some skilful persons will work out the phone unlock, or else I'll have to use one of those lil' chip sim cards that ride on top of your existing SIM to spoof the network. Now I just have to wait for Bic Camera to call me with my baby. Wow, almost $3000 in a matter of days! There'll be lots of days eating just rice from now on. Travel agents in Japan are really misleading. You see some really fantastic looking airfares in the local rags, Metropolis and Tokyo Notice Board. (The later has an unintentionally funny or desperate lonely hearts classified section). One of the "tricks" is that all these wonderful fares are excluding any fuel and tax surcharges that you always have to pay. In Australia, Qantas tried to get away with the same stunt to bait people into buying their tickets. Unlike Japan, a LOT of people didn't like these tactics, and not too long after that they decided to publish the real, full price of tickets that they sell. Japanese people don't want to "upset the harmony", so they just put up and shut up. Another trick is to charge foreigners more than Japanese because of the mistaken belief that foreigners will buy a cheaper return ticket and not use the return flight. Of course they can say the cheap flight seats have been booked out. Mark Up! Another miserable, rainy day in Tokyo made me wish for a nice summer vacation back home with my family, my car and guitars. That, and the homesickness I'm feeling from too much Japanese and not enough English. So I wandered into the local travel agent hoping for a decent fare to let me take a well-earned break (and to get the hell away from Japan for a while). I tried a few weeks ago, but I baulked at a fare that was about 170,000 yen return. I should have booked that. When I returned today the only option was a 167,000 fare. (Of course taxes were an additional 70,000 yen!). I politely declined and went to my lessons feeling a little more down than usual. It actually made me want to be back in Australia even more. Coming back to the apartment, I got a second wind and thought if I couldn't go back home, I'd try to book a flight somewhere else like Hong Kong. Unfortunately while the fare was much more favourable, the timings weren't so great. Feeling defeated I tried Plan C, which according to Plan C's wasn't the worst possible option. (That would be staying in Tokyo and bearing the freezing winter). I thought to look at Jetstar, a subsidiary of Qantas. At the time of writing, they are the cheapest way to Australia, minus frills like food and drink. The Australian dollar isn't so great right now (AU $0.58 = 100 yen), so it's a particularly good time to travel to Australia, and to be earning a salary in yen! To cut a long story short, the fare was quite a bit cheaper than the one I was quoted at the agency, so I just went ahead and booked it. Once I hit that process button I felt an instant wave of calm thinking that soon I'll be back in a land without endless compromises and.. English! Mostly I've been to-ing and fro-ing if I want to spend another year in this place. I know that coming home will help me decide for sure. If it's anything like last year's letdown, I'll probably be here for another one. I guess we'll just have to wait and see, eh? This is the new Pocky "cheerleader" ad from Glico I've seen often, while walking across the busy Shibuya crossing. Makes me want one right now. One of her.. This is the lovely Shiori Kutsuna in fantasy cheerleader costume, giving me an irresistible urge to have some Pocky right now. Could this bring about a defection from Crunky? This is one way to get students. This was innocently located on the noticeboard. The rest was in Japanese. The funniest line I thought was, "I ate out my wife". That is hilarious because you actually hear stuff like that. Other classics are, "Get pushy" and "I'll have a small Coke". I was asked this at Yotsuya train station tonight. I should've said "No, I'm a doctor" or something. Dammit, is it that obvious? Anyhow, this woman wanted to have some private lessons to learn English. I haven't taken up any offers of extra lessons yet, but I'm warming to the idea. Some more money to complement my "lavish" lifestyle would be great right now. From our short conversation I'd put her at a fairly low level of English, but it might be something I can work with. She said she didn't have enough money for language schools, so I hope she's not expecting ultra-cheap lessons. Any other Japanese looking for some help with English, PM me. Let's talk! I'm really happy that Japan has a LOT of holidays. Today just happens to be Sports Day which goes by the "Happy Monday" system of moving holidays to mondays to allow for a three day weekend. Apparently it's a day to commemorate the Olympics to promote health and fitness. For me it would've been another day of laziness and doing nothing. I hadn't been there for almost a year and a half, so I decided to go back to Toyko Dome City in Suidobashi. These days it's not so far from Yotsuya. I wasn't feeling too genki so I chickened out of riding "Thunder Dolphin" again. That, and a forty minute line put an end to that thought. By the time I got home it wasn't late so I went into Shinjuku and had another meal at that Indian restaurant again. Third time and still good! While I've been a really good boy and stayed away from playing the UFO catchers (I still went, but I didn't play most of the time), I had a job to do. The gf wanted to buy a pack of Ponyo playing cards for her friend's daughter. Looking around the shops it's quite hard to find them. So the only answer was for me to "win" them at the catchers. For those that don't know, Ponyo is the latest animation for Studio Ghibli. Those that have seen it say it's not that great. More a children's tale than some of the others. This took about 500 yen to sink. Cards are quite difficult to get quickly. They position the packs too far away from the chute. With some persuasion I got the staff to give me a fighting chance. For me, my favourite Studio Ghibli is My Neighbour Totoro. If you see only one of these animations, let it be this one. Trust me, it's the best by far. For kids and adults it can't be beat. Later after work I thought it'd be a good idea to go for the Totoro cards as well. Unfortunately this was harder than the Ponyo cards. If my maths is right, it cost me 1,200 yen. Not quite a bargain. One nasty side effect of Ponyo publicity is hearing the theme song sung constantly on Japanese TV by 8 year old brat, Nozomi. I'll take the Totoro song any day. Alternatively I'm open to "Don't Know Why Y Didn't Come". Some may think this may be a redundant post (like the other 300 or so other ones I have done so far), but I'm feeling quite happy right about now. One thing you find out pretty quickly is that Japanese deodorants aren't too good, judging from the funk you might smell on peak-hour trains in the summer. Actually even still now that summer is over, because JR and co. have decided that we don't need air-con on at all these days. Worse yet, one of the most popular brands of Japanese deodorants (the one I always see on the shelves) is called "Gatsby". sugai! Yes, so gay. The deodorant I was using in the meantime was Ag+ by Shiseido. Yes, it's a girl's deodorant, but it's scentless, so I didn't smell like a girl thankfully. It worked ok. I didn't really smell too bad, but it didn't make me feel dry. The hilarious thing is that for their advertising they use Grandma Betsy Lyons. You MUST check out the video on the previous link. Anyway, thanks to BBD I now have some roll-on deodorants from the land of the free (and probably less stinky), a Mennen "Speed Stick" and Axe Dry "Essence". On the Mennen Speed Stick it says on it "great clean scent". To this nose it smells like a just cleaned bathroom. Freshness! For a bit of useless trivia, Mennen also produced the "Teen Spirit" deodorant for girls that Nirvana used as the title of their big breakthrough hit. The Axe smells a bit more "manly". A bit hard to describe, but it's a typical scent if you're familiar with this brand. I don't know which one to start with. I was suggested one under each arm to see which one works best. So, from now on there will be slightly less Jimmystink® from me. Yes, it's a school night, but tonight I'm venturing to a disco in Ginza. No, not a club, a disco. Why so? Because the clientele were mostly salarymen and "office ladies". One thing that should come as no surprise to people who've observed Japanese trying to dance, it's actually quite funny. The best way I can describe it, is imagine how people sing at karaoke. Got it? That's how they dance as well. Unlike some blogs you read I am not bad-mouthing these people. I want to empower them with the courage to not dance the same two-step moves that I used to do in primary school. Let go and forget about your sarari-man lives! Unfortunately when I arrived there, it was mostly a sausage fest, but thankfully after a short while, there were a few not too shabby ladies making an appearance. A lot of the girls don't do much better than the guys and need non-Japanese to show them how to dance. It's like "Footloose", where people need to be told it's ok to dance like a fricken idiot. So.. in "teaching" these people how to do "it", we let it go showing those Japanese what it means to dance. Dance like a fool, and let them follow.